Thanks for the Mother’s Day card. Mark called us Sunday morning and thought he got us out of bed – he didn’t – we were still in, but awake just enjoying not having to get up. We usually go to church at 11, so there is not any hurry about getting up. John called us Sunday evening, so all in all I can’t complain about being remembered on Mother’s Day. Dad took me out to dinner – we went to the Nu-China Café and had a Chinese dinner. It was very good and if you come home this summer – and or course, you know it made us very happy when we read your last saying you were planning to come – we will take you there for a Chinese meal. We made a down payment (bought the equity of previous owner) on the house at 118 Juniper Court yesterday. We won’t get possession until June 17th. A contractor is coming this evening to talk to us about the remodeling we want to do. He will have to do some figuring then let us know what the estimate will be. One contractor is figuring now, but says he can’t get to it until Sept. The man who is coming tonight says he can start in June, so if his price isn’t too high, we may be in the midst of remodeling soon. We plan to start moving as soon as we get the house and be finished by July 1. I talked to the agent at the bank and he said we could get out of this contract, which was for one year. Today I attended an Officer’s Training meeting at Battle Ground. Am to go to Rochester tomorrow. Conferenece at Purdue next week. I am on a luncheon committee and have to help decorate tables for a ladies luncheon. After building bookshelves for the family room here, Dad has to move all these shelves down to the house on Juniper. – We just had a conference with a contractor and he assures us he will be able to begin on the house in June and thinks he can have it finished in 5 weeks. I just hope he is as good as his word. We received word by Ruth Ford yesterday that Mrs. Myers had fallen more than a week ago and broke three ribs. She, of course, is in the hospital at Brook and will probably be there for some time. We haven’t been in Kentland this month and since we plan to go to Centerville next weekend we plan to go to Kentland May 26th and Dad is going to have office hours the 27th and we plan to see Mrs. M. sometime during the weekend. On Saturday evening we are to go to Champaign and spend Saturday evening and Sunday with John, Lea, and Bob. We received a letter from Duane. He wants to get a family wappen, so I have written to him giving him the address of the place where we got ours. 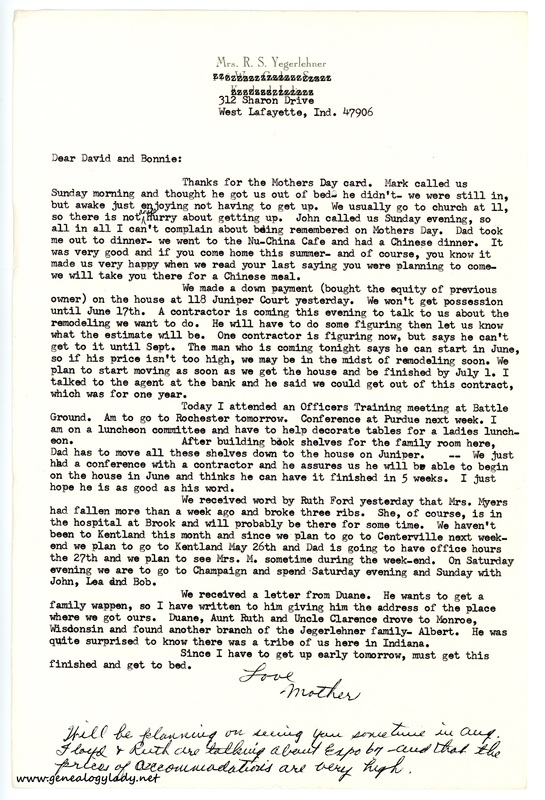 Duane, Aunt Ruth and Uncle Clarence drove to Monroe, Wisconsin, and found another branch of the Jegerlehner family – Albert. He was quite surprised to know there was a tribe of us here in Indiana. Since I have to get up early tomorrow, must get this finished and get to bed. Will be planning on seeing you sometime in Aug. Floyd & Ruth are talking about Expo [?] – and that the prices of accommodations are very high. This entry was posted in Genealogy, Yegerlehner and tagged 1960s, Albert Jegerlehner, Boston, Boston University School of Theology, Clarence E. Yegerlehner, David A. Yegerlehner, Duane Yegerlehner, Floyd V. Yegerlehner, Gladys R. (Foster) Yegerlehner, Indiana, John F. Yegerlehner, Lafayette, Mark A. Yegerlehner, Massachusetts, Roscoe S. Yegerlehner, Ruth (Salter) Yegerlehner, Ruth E. (Yegerlehner) Mutchler, Ruth Ford, Ruth M. Myers on April 4, 2017 by Deborah Sweeney.